Following a recent investigation, European anti-trust regulators have formally objected to Oracle’s acquisition of Sun Microsystems. The main issue is MySQL, the world’s most popular open-source database: the EU believes that the takeover could harm competition. [The EU objection] reveals a profound misunderstanding of both database competition and open source dynamics. It is well understood by those knowledgeable about open source software that because MySQL is open source, it cannot be controlled by anyone. That is the whole point of open source. Both Oracle and the US Justice Department have stated there are at least eight strong players in the database market so anti-competitive practices are unlikely to be successful. However, investors had already responded to possible EU objections and Sun is currently trading at more than 12% below Oracle’s takeover offer of $9.50 per share. MySQL is not a direct competitor to Oracle’s enterprise databases, but developers will be suspicious of the company’s motives. Oracle could embrace MySQL and exploit the market by selling consultancy, training, reference guides and database migration tools. However, they could also starve MySQL of developer resources and remove Sun’s supporting websites and services. Unfortunately, Oracle have remained tight-lipped about their plans for MySQL. Although MySQL’s open-source development does not depend on the company, forking the database into multiple systems is unlikely to benefit anyone. Finally, are there really eight “strong” players in the database market? MySQL dominates the web and switching to another system is not a task many site owners and developers would be willing to undertake. 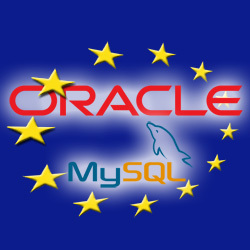 Are you concerned about Oracle’s takeover of MySQL? Oracle and MySQL: Ally or Die?